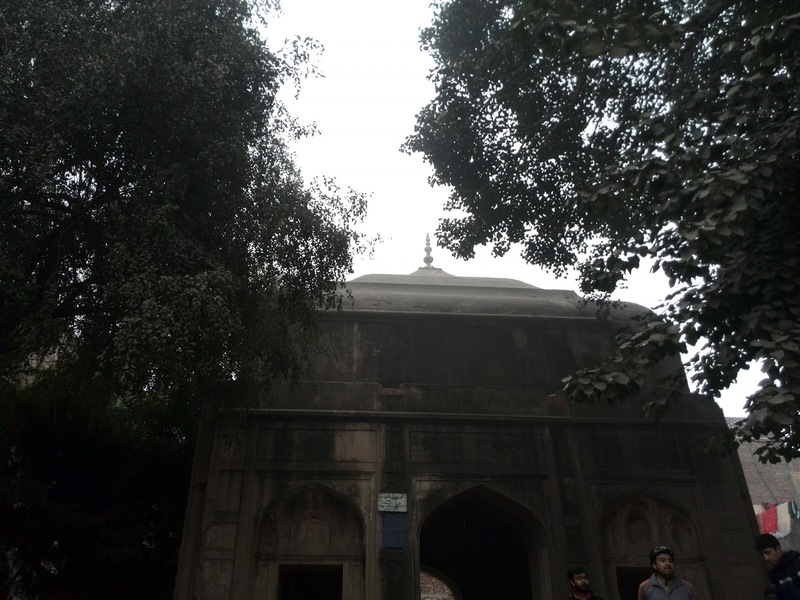 Having seen one tomb too many during our recent cycling trips, we thought a visit to Chauburji would give us a break from the ghosts and ghouls of the Mughal nobility. Pedalling on Jail Road till Qartaba Chowk, we turned left on to Bahawalpur Road, which runs athwart the huge Miani Sahib Graveyard in Mozang. A few minutes later, the four turrets or burjis of the famous gateway appeared through a mishmash of ugly billboards, and equally unsightly wires and cables that cluttered the skyline. Mian Bai must surely be turning in her grave, we thought. 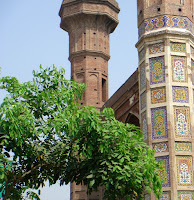 Several monuments of Lahore – as in the rest of the country – have a controversy about the occupant of a tomb, or the builder of a mosque or gateway. Chauburji is no exception, and the inscription above the arch is of little help. “.... Bestowed on Mian Bai by the pleasure of Sahib-e-Zebinda, Begum-e-Dauran”, left me perplexed, though mention of the year of completion ie, 1056 Hijri (1646 AD) turned out to be a good clue for some sleuthing. Zebinda has been thoughtlessly assumed to be another name of Zebunnisa, the daughter of Emperor Aurangzeb, without paying heed to the fact that she was only eight years old in 1646. She was an accomplished poetess in her own right, but that is about all she is renowned for. A more likely candidate is her aunt, the suave Jahan Ara Begum, Emperor Shah Jahan’s eldest daughter, who had a much wider canvas of activities that included poetry, writing, fashion designing, building of Agra’s famous mosque, and several landscaping projects at Shahjahanabad, her father’s new capital north of Delhi. With such accomplishments under her belt, she quite fits the titles: ‘One Endowed with Elegance (zebinda)’ and ‘Lady of the Age (dauran)’, the latter having been especially bestowed by her father after the death of Mumtaz Mahal. 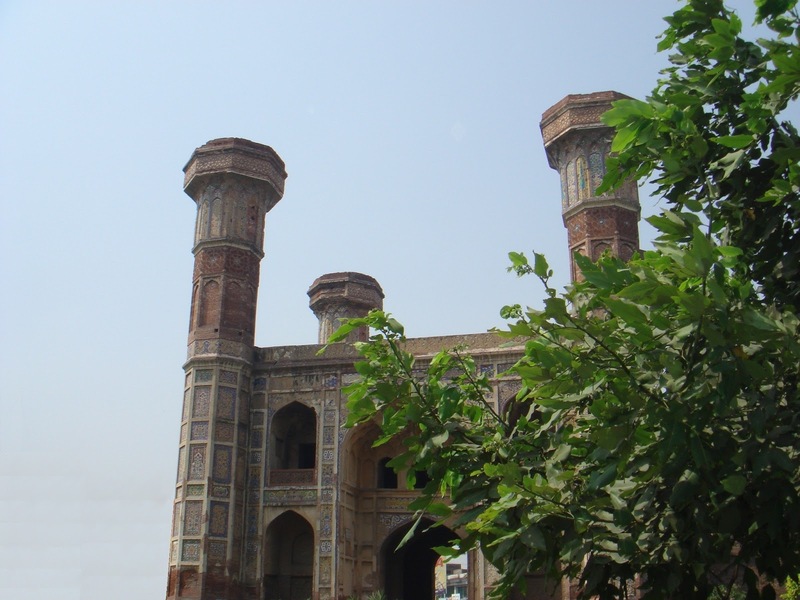 Mian Bai Fakhrunnisa, perhaps a lady-in-waiting and confidante of Jahan Ara, is said to have supervised the laying of a garden in Lahore, of which Chauburji was the entrance gateway. She must have earned the pleasure of her mistress, who bequeathed it for the services rendered. I may speculate, though, that Mian Bai could well have been rewarded for nursing the princess back to health, after serious burn injuries suffered in an oil lamp accident in the palace in 1644. As at most historic sites in Pakistan, we were dismayed to see scruffy vagabonds sprawling on the Chauburji premises, posters pasted on its walls, and litter everywhere around. The remnants of brilliant floral-themed Kashi-kari panels on portions of Chauburji could do little to alleviate the mess. Nobody seemed to be in charge. 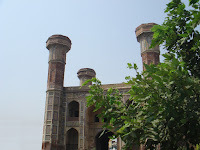 The Chauburji Gateway is quite similar to the Gulabi Bagh Gateway in Begumpura, except for the absence of turrets in the latter. Chauburji’s east-facing main entrance arch (peshtaaq) is flanked by four smaller arches; of the latter, the two on the ground level are simply deep-set alcoves, while those on the upper storey are openings of balconies set with stone-carved jaali guardrails. The turrets are of octagonal shape and these flare upwards, possibly having been surmounted by Rajasthani chhatris, since lost. In fact, the north-western turret fell off during the earthquake of 1843 and was replaced in the 1960s, the gateway having seen life as a ‘Sehburji’ for nearly 120 years. Today, there is no trace of the garden that the Chauburji once opened into. From Chauburji, we set off south on Multan Road to look for a mystery tomb, again rashly attributed to Zebunnisa. After covering 1.7-km, (about 200 metres past the Samanabad Main Road and Multan Road intersection), we came across a fenced enclosure on the left, amidst a row of wall-to-wall shops; it had a steel-grill gate locked by a loose chain. With no one to guide us in, we helped ourselves through the narrow gap in the gate, only to be surprised by two families who seemed to own the premises. A small hand-painted board claims the tomb to be of Zebunissa, with another one sardonically notifying the public of its ‘protected’ status under the law! It is well documented that Zebunnisa was confined in Salimgarh Fort on charges of colluding with her brother Akbar II, against their father Emperor Aurangzeb. She spent her last 21 years in confinement, and on her death in 1702, was buried in the garden of Thirty Thousand Trees outside Kabuli Gate in Delhi. Her remains were re-interred in the tomb of Emperor Akbar in Sikandara, when a railway track was laid across her previous resting place. With Jahan Ara also buried in Delhi (Nizam-ud-din Auliya Graveyard), the only remaining subject known to be associated with Chauburji is Mian Bai, which makes her a credible candidate as the tomb’s occupant. The tomb was central to a funerary garden in the Nawankot locale. Only the gateway and two corner kiosks of a wall that enclosed the garden are extant, while the garden has been completely subsumed by the concrete jungle all around. The thick-walled tomb is a small square structure built on a brick platform. It has three arches on each side, with the central main arch flanked by two recessed ones having small oblong openings. 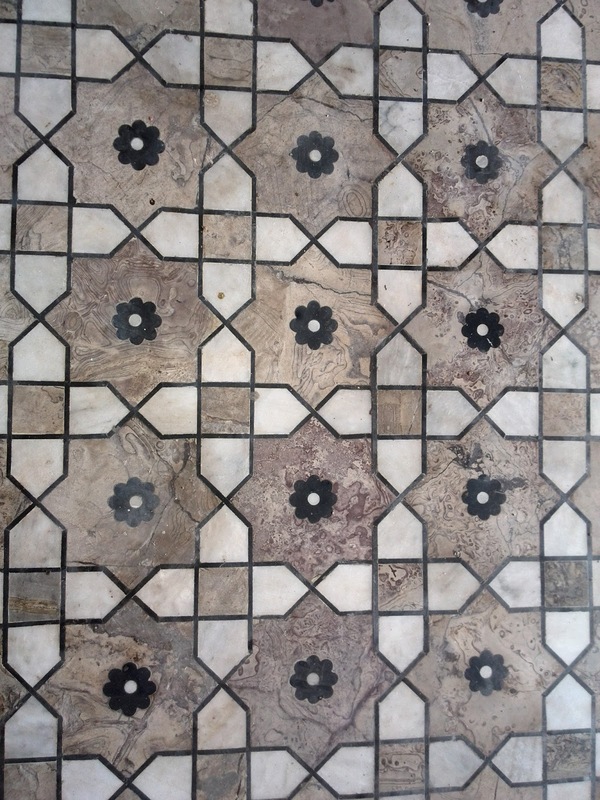 A cenotaph lies on a partially broken marble floor that still displays a beautiful pattern of eight-pointed interlocking stars, and each star set with an eight-petaled daisy. The roof of the tomb is of an unusual pyramidical shape on the outside, but is hemispherical on the inside. The immediate threat to the tomb is by encroaching residents as well as some shops of timber cutters, which lie within the premises of the supposedly protected building. Additionally, a huge pipal tree grows a few feet away from the tomb, and its sub-terranean roots are likely to damage the very foundations of the tomb. 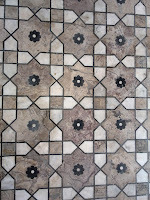 The beautiful marble floor has already been uplifted in several places. Something will have to be done urgently about these issues if the tomb is to be preserved. About 95 metres east of the tomb is the gateway to the erstwhile garden. We had to approach it through a narrow street behind the tomb, with the neighbourhood watching us with some amusement. The design of the gateway is very similar to that of Chauburji, except for four squat chhatris that embellish the corners of the roof. We were extremely dismayed to see the gateway used as a garbage dump by a nearby marriage hall, what with cats and dogs prowling around. The chowkidar, along with a few shady characters emerged from the upper storey, which got us wondering if that part of the gateway was being used as living quarters. The two remaining corner kiosks of the garden wall were in no better shape than the gateway. The kiosks are 100 metres away from the gateway, in a northerly and southerly direction, each being located in an empty plot surrounded by houses. People in the neighbourhood seemed surprised at our interest in what they thought were useless relics in their midst. I thought the final resting place of Chauburji’s construction supervisor, the good old Mian Bai Fakhrunnisa, needs to be well-looked after. A similar good turn is also in order for Dai Anga, who gave the Lahorites a beautiful mosque … if we care, that is. This article was published in the daily newspaper The News International on 8 Feb, 2015.